The Connetquot Teachers Association was recently notified that Spanish language teacher Ms. Cheryl Sosa had been honored on March 28th by the Spanish Embassy. At a special ceremony in NYC, sponsored by the Ministry Education of the Spanish Embassy, Ms. Sosa was awarded an academic scholarship to study at a Spanish University during the month of July. This financial award will pay the cost of tuition, room and board during her time in Spain. Cheryl's work in the classroom brings the Spanish language alive for her students. Ms. Sosa is a prime example of the passion for learning that Connetquot teachers provide for our community's children. Ms. Sosa has taught Spanish for 27 years, 24 of them at Connetquot High School, and annually arranges for her students to travel to the Iberian Peninsula to practice what they've studied in the classroom. 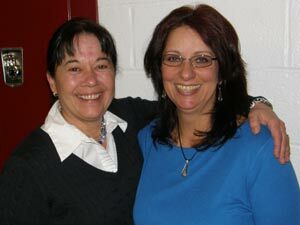 Congratulations to Ms. Cheryl Sosa, and best wishes for an exciting period of study in Spain this summer! Foreign language department colleague Mrs. Eileen McGuinness congratulated Cheryl Sosa when it was announced that Sosa had been awarded a scholarship from the Spanish Embassy, for study in Spain during the month of July.